If you are having problems charging your iPad, it's probably not the tablet. While the batteries in smartphones and tablets won't last forever, they tend to fade slowly, so you will notice the problem long before the iPad stops charging completely. More likely, there is a problem with the way you charge the device rather than the iPad itself. This is especially true if your iPad charges but charges slowly. Are You Charging Your iPad With Your PC or Mac? If you are using your laptop or desktop PC to charge your iPad, it may not be outputting enough power to get the job done. This is especially true when it comes to older PCs. The iPad requires considerably more power to charge than the iPhone, so even if your smartphone charges up fine with your PC, the iPad may take a lot longer. In fact, if you are hooking your iPad up to an older computer, you may even see the words "Not Charging." Don't worry, the iPad is probably still charging, but it isn't getting enough juice to display the lightning bolt that indicates it is charging. The best solution is to plug the iPad into a power outlet using the adapter that came with the iPad. If you absolutely must charge using a PC, do not use the iPad while it is charging. This can result in the iPad not gaining enough power to actually charge or even losing more power than it is gaining. 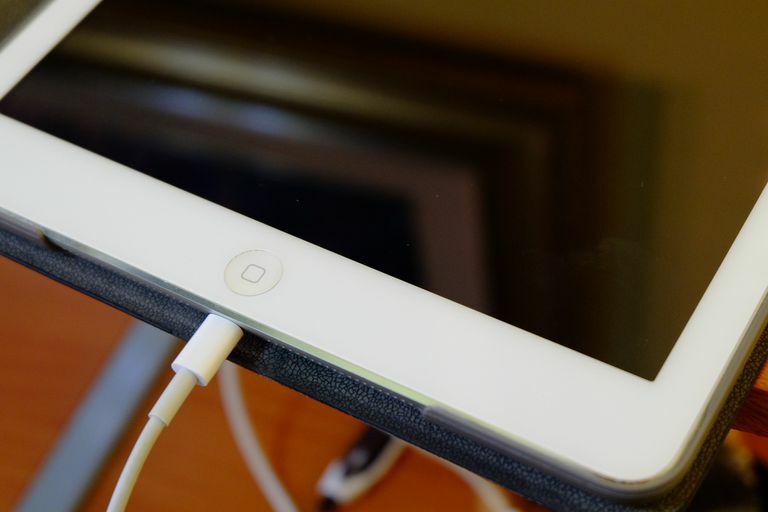 Are You Charging Your iPad With Your iPhone's Adapter? Not all power adapters are equal. The iPhone adapter you are using may be supplying the iPad with half the power (or even less!) of the iPad adapter. And if you have an iPad Pro, the iPhone charger will take even longer to bring it up to 100%. While the iPad should still charge with an iPhone adapter, it can be a much slower process. Look for markings on the charger that read "10w", "12w" or "24w". These have enough juice to power up an iPad quickly. The 5 watt adapter that comes with the iPhone is the small charger that does not have markings on the side. Want to charge your iPhone quicker? The reverse is also true: an iPhone will charge faster using an iPad's AC adapter. Is Your iPad Not Charging Even When Connected to a Wall Outlet? First, make sure the tablet doesn't have a software problem by rebooting the iPad. This will help out if a software issue is causing the problem. Hold down the wake/suspend button at the top of the iPad. After a few seconds, a red button will appear instructing you to slide it to power off the device. Let the iPad power down completely and then hold the suspend button down again to power it back on. You'll see the Apple logo appear in the middle of the screen while it boots back up. If the iPad still will not charge through the electrical outlet, you may have a problem with the cable or the adapter. You can quickly find out if you have a problem with the cable by connecting the iPad to your computer. If you see the lightning bolt on the battery meter, you know the cable is working. If this is the case, simply buy a new Lightning adapter. If the computer does not react when you plug in the iPad, it's not recognizing the iPad is connected. You should try another cable to see if that fixes the problem. If plugging in a new cable doesn't work, you may have a problem with the charging port. The most common problem is that some type of dust, lint or other material has made its way into the port. This is more common with the iPhone, which goes into and out of your pocket more often, but it is also possible with an iPad. If you turn the iPad upside down and shine a flashlight down the port, you should be able to see if any materials are clogging the port. You can use an anti-static brush to clean out the port. If you use small tweezers, turn off the iPad before attempting to dislodge materials and be careful to touch the sides of the port as little as possible. You can also take your iPad to an Apple store and have someone from the genius bar perform the cleaning. They will usually do this for free.